Abeokuta — Former President Olusegun Obasanjo has said that until Nigerians, especially the political class, begin to do things differently from the past, the country will remain what it is today. Obasanjo, who spoke yesterday when former Governor of Sokoto State, Attahiru Bafarawa, paid him a courtesy visit at the Olusegun Obasanjo Presidential Library (OOPL) in Abeokuta, said it was regrettable that despite all its potentials, Nigeria "today" is not a country that any right thinking citizen could be proud of. He said: "If we don't act together as expected, Nigeria will not be what it should be, come 2019." Bafarawa, who was accompanied by his presidential campaign team, said he came to inform Obasanjo of his ambition and also ask for his blessings. The former governor, who stated that the political situation in the country is in a confused state because politics has become an all-comers affairs, said: "Unfortunately, we, in Nigeria, are unfortunate to play democracy the way we are playing it, because 90 per cent of the players are not politicians. The mistake we are making in politics is that you cannot be a Ph.D. holder without passing through a primary school." 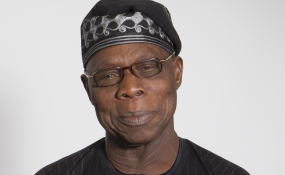 Meanwhile, Obasanjo, who noted that diligence, humility and love for the country are some of the attributes he would love to see in a Nigerian president, said no amount of intimidation or threat would make him stop speaking when he notices that things are not going in the right direction in the country. "If we keep on doing the same thing, the same way, the result will not be different. We must do things differently to get different results from the past and I believe we can do things differently. "The situation of Nigeria today is not the one any right-thinking Nigerian should applaud. And my own strong belief is that Nigeria deserves better than we have now. And we can get better than what we have."